friday, september 22 from 12:30pm-2:00pm the time has come, summer is gone, fall is here and moving very quickly!! 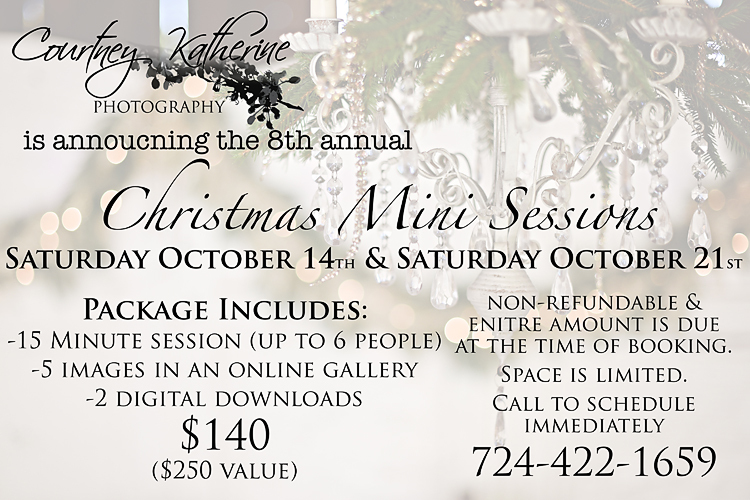 christmas is just a few short months away……and CKP is ready for their 8th annual christmas mini sessions!! they are back by POPULAR demand!! i know this blog posting has been much anticipated by many…..let’s see how fast we can get the 2 days booked! I have opened up a few extra spots both days and have a total of 36 spots available for these 2 DAYS ONLY!!! there will be at least 5 images in an online gallery for viewing and you are able to pick your favorite 2 digital images that you can use on christmas cards and to print enlargements. you may purchase additional digital images for a discounted price of $75 $40 per image or you may purchase prints a la carte. SATURDAY OCTOBER, 14th and SATURDAY OCTOBER 21st are the ONLY 2 days for christmas mini sessions. sorry, no refunds available after your booked spot. so, now what are you waiting for? i have a very limited number of spots, and it is first come, first serve. so call me today to book your session! last year’s spots were filled very quickly in a record time! please do not leave a voicemail if your call is not answered, try calling back in a few minutes.